I guess the first thing you want to know is what those chords are. Well let me start by saying the relationship between the chords is I, V, Vi and IV. If that doesn’t mean much to you, don’t worry. In the key of C that gives us C, G, Am and F.
Try playing through those chords a few times, almost immediately you’ll start to hear songs you know as you play. Change the order and you’ll start to recognise even more. Try some different strumming patterns (get some help with strumming here) with those chords and see if you can hear anything you recognise. This is probably best shown with the rather brilliant 4 Chords video by Axis Of Awesome. If you’ve not seen it already (where have you been hiding?) take a few minutes to watch it now. Ok that might be only 47 and I did say hundreds but Axis Of Awesome had to stop somewhere otherwise their video would have gone on for hours. The truth is there are loads more to go at. Even just noodling around with those chords for a while you’re likely to find a few new ones. Why do so many songs use the same chords? Technically all of the songs listed above don’t use the same chords. They use the same relationship between chords. Axis of Awesome simply transposed all of the songs so they could play them using the same 4 chords and they’re completely recogniseable. It’s the relationship between those chords that’s the important bit. Ultimately it’s pretty simple, this combination of chords works incredibly well together. There’s just something that is pleasing to our ears about those chords and that keeps musicians coming back time and time again. The thing that amazes me about it though is that songs can sound so different despite being based on the same formula. It’s a chord combination that crosses genres too as you’ll see from the list of songs above. I’ve set the video to play from the point that Josh starts playing but the whole video is worth a watch if you’re interested in learning. If you need some help getting to grips with this rhythm – check out my post on the most important strumming pattern you’ll ever learn. As I always say though, just use it as a guide. If you’re trying to play 47 songs using the same chords with the same strumming pattern it’s going to sound a little bit boring sooner or later, so experiment with missing some strums here and there to build your own patterns and it will sound so much better for it. For some more strumming pattern inspiration take a look at my post – 32 ukulele strumming patterns. Although Axis of Awesome play the songs using E B C#m and A. Those chords can be transposed into a completely different key as long as we retain the relationship. In the key of G for example the chords would be G, D, Em and C. Try it now using those chords instead, can you still recognise the songs? Hopefully your song repertoire has just increased considerably! This is so true! 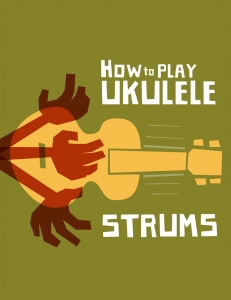 It’s why the `ukulele is such a “deceptively” easy instrument: 4 chords and you can be a superstar! I saw Axis of Awesome do this live on stage…too funny! Mahalo for sharing this! Wow, you saw it live, that’s amazing Lina! Thanks for commenting. I got my first ukulele a few days ago and I’ve been in love with the instrument ever since. Thank you so much for this amazing article, I’m so excited to get started! I didn’t know about those chord relationships until you stated so here! It’s really helpful, I’m so glad you put this up! Can you please show the tabs for these songs? The websites I’ve used to show these tabs return more than just 4 chords. Hey Koz, you’re right – the Axis of Awesome guys cheated a little but it was purely to illustrate the diversity of 4 chords. Some of the songs in their list do use more than 4 chords for the verses and other sections of the songs. That said, there are still hundreds of songs out there that do stick strictly to 4 chords throughout. Hi Rachel, I’ve updated the post with some help on this. I total agree I also know how to play the four chord but unable to play it into music, I find it frustrating may be like yourself. Incorrect. There are many variations of the 4 chord pattern necessary to play these songs. For example, Let it Be by the Beatles begins with the standard pattern but then immediately changes to C G F. Then the bridge starts in Am to G F C. Once you familiarise yourself with the 4 its easy to pick out but almost every song on this list has variations to the pattern. With or Without you by U2 is a delightful exception and a great song to practice with. C,G, Am, F all the way through!!! Give it a go! The point of the post is to show the versatility of the chord relationship. Axis of Awesome have picked sections of the songs where this will work and done a fair bit of transposing along the way. That said, I still think it’s a great lesson, particularly for those that thing learning to play an instrument is in an insurmountable task. Demons by Imagine Dragons Riptide by Vance Joy, and Love Yourself by Justin Bieber are three others that use the same four chords. All are C.G.Am.F. Didn’t know Josh Kaufman yet. Thanks! and more! it seems this 4 chord this is quite popular bettween song writers, it’s their secret wepond lol!